Five months before retiring, Julian’s fire chief violated state law — threatening volunteer firefighters involved in a vote of no confidence in his leadership, a labor agency says. 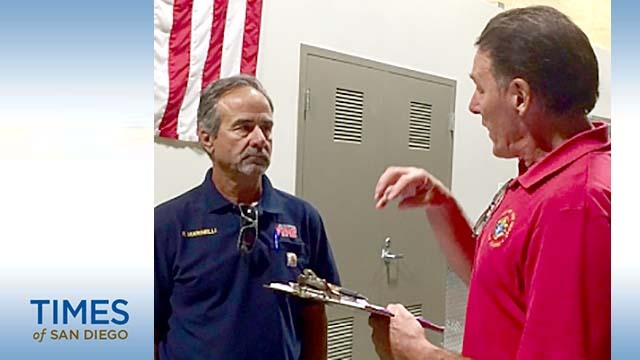 But Rick Marinelli, who left as chief in late May, denies allegations made in the state agency’s complaint against the Julian-Cuyamaca Fire Protection District. According to a June 19 letter from lawyers with the Public Employment Relations Board, Marinelli in December threatened disciplinary action against those involved with a November no-confidence letter. He also individually interrogated members of the Julian Volunteer Fire Company Association, said the PERB complaint. Thus Marinelli “interfered with employee rights guaranteed by the Meyers-Milias-Brown Act” in violation of state law and committed an unfair practice under state law and PERB rules, said the agency, which acts like a National Labor Relations Board for certain employee groups. 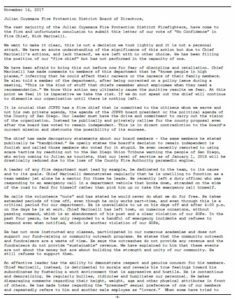 At the time, Marinelli and members of the fire board questioned the letter — which claimed to be from the “vast majority” of Julian firefighters — since it wasn’t signed. Felix De La Torre, the PERB general counsel, said state law doesn’t specify a potential penalty against the fire district. “The [PERB] board can be as creative as it wants,” he said Monday in a phone interview from Sacramento. The four-member PERB board (which includes former San Diego labor official Eric Banks) can design “remedies that would address the violation,” he said. 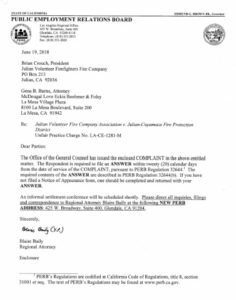 Although the Julian fire station is now headed by a Cal Fire veteran, installed by County Fire Authority Chief Tony Mecham, the county declined to discuss the PERB letter. “We are not a party to the PERB complaint and we have no comment on the merits of the allegations,” said county public-safety spokeswoman Alex Bell. Critics of Marinelli, trading thoughts via email, have suggested that he lose his $26,400 severance. But “that would be a very unusual remedy for the board to issue,” De La Torre said. First the parties have to meet. If mediation doesn’t result in a settlement, De La Torre said, a formal hearing would take place at PERB’s Glendale offices before an administrative law judge. Julian firefighters would have to produce witnesses and documents supporting their case. The judge would then issue a proposed decision — which wouldn’t be final until after a 20-day appeal period (if nobody appeals). “If it does get appealed … the board can either adopt the decision of the ALJ or modify it in their own way,” De La Torre said. Or the board can overturn it and write a completely different decision. Although his board has until about July 9 to respond to the PERB letter, Shelver told Times of San Diego: “I’m sure” the district will deny its claims. “The allegations in that vote of no confidence … are mostly bogus,” he added in a phone interview. Shelver said the board “took care” of the issue via Marinelli’s March 20 separation agreement, though the chief voluntarily retired. In his first extended media interview on Julian fire issues since the fire board voted to apply for district dissolution, Marinelli backed the board’s effort to end the county’s last backcountry volunteer fire department. “I think for the future of public services in Julian and health and safety of the public, it’s the right decision,” he said, noting that in November 2014 district voters rejected a yearly “benefit fee” increase to bolster district finances. Marinelli said the community didn’t want to pay more taxes — forcing the board to look to join the San Diego County Fire Authority, which contracts with Cal Fire for fire and emergency services. He said a November ballot measure to raise the longtime $50-a-year benefit fee to $200 a year is “basically the same exact tax initiative” of 2014. He also denied pushing the district toward dissolution. “That was the board of directors who did that,” he said. Marinelli addressed other lingering questions. Regarding the County Fire Authority: “The county the whole time told the district, even at the end of 2017, … if you agree to negotiate, we’ll keep supporting the district with a paramedic engine and the funding and the dispatch services…. If you don’t want to negotiate, we’re going to end that contract. Regarding the fire volunteers: “They don’t have to leave the district. They just become county volunteers” by undergoing a physical, background check and added training. But he said defensiveness of the volunteer fire crew has created “a pretty hostile” situation. “I think there was a lot of room for some dialogue and some negotiations to happen, but all this negative press and talking and Facebook stuff has made that kind of dialogue impossible,” Marinelli said. A Julian resident since 1981, where he raised a family, the five-year chief said he owns a home around the corner from the 14-month-old fire station. A widower for 10 years, Marinelli now shares an Ocean Beach apartment with his girlfriend, he said. Though he’s being deposed in a dissolution-related lawsuit Tuesday, he’s feeling less heat. “There’s been a lot of inappropriate and misleading [claims] and name-calling, and a lot of accusations made against me as a chief,” he said. Supervisor Dianne Jacob — who favors the JCFPD losing its independence – has come under fire as well. Local opposition is being blamed for her bowing out of the Julian Fourth of July Parade despite her presence being promoted. She rode a horse for years in the parade before transitioning to an easier-on-the-hips vehicle ride, said one local organizer. Marinelli might miss the event as well — saying he was heading to Colorado next week to see his daughter.